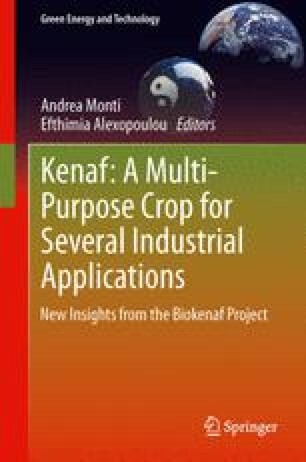 This chapter discusses the origin and taxonomy of kenaf, the description of the plant parts (stems, leaves, flowers, seeds, and root), the importance of the crop worldwide, the cultivation area, as well as its importance. Kenaf (Hibiscus cannabinus L.) is an annual spring crop cultivated for long (4000 BC). It originated from Africa, disseminated in the 1900s in Asia (in India and then in China) and in the 1940s from Asia to northern and central USA. Kenaf belongs to the Malvaceae family and section Furcaria. It is closely related to cotton, okra, hollyhock, and roselle. Nowadays it is being cultivated in 20 countries worldwide and its total production (kenaf and allied crops) is 352,000 tons (2010/2011). Currently, China and Pakistan are the main producers. In the last part of the chapter the importance of the crop is discussed. Kenaf is an annual non-food fiber crop that used to be cultivated for numerous uses (paper pulp, fabrics, textiles, building materials, biocomposites, bedding material, oil absorbents, etc.). Recently, it is also considered as an important medicinal crop as its seed oil is recorded to cure certain health disorders and help in the control of blood pressure and cholesterol.